نواب پور, علیرضا, یوسفی, احمد علی, طالبی, محمد. (1397). تحلیل فقهی کارکردهای پول‌های رمزنگاری شده (مورد مطالعه بیت کوین). اقتصاد اسلامی, 18(72), 213-243. علیرضا نواب پور; احمد علی یوسفی; محمد طالبی. "تحلیل فقهی کارکردهای پول‌های رمزنگاری شده (مورد مطالعه بیت کوین)". اقتصاد اسلامی, 18, 72, 1397, 213-243. نواب پور, علیرضا, یوسفی, احمد علی, طالبی, محمد. (1397). 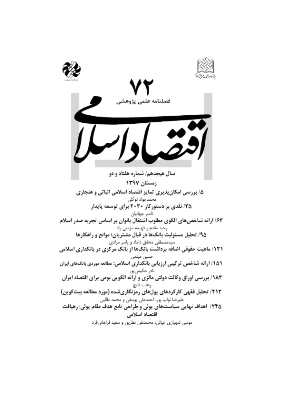 'تحلیل فقهی کارکردهای پول‌های رمزنگاری شده (مورد مطالعه بیت کوین)', اقتصاد اسلامی, 18(72), pp. 213-243. نواب پور, علیرضا, یوسفی, احمد علی, طالبی, محمد. تحلیل فقهی کارکردهای پول‌های رمزنگاری شده (مورد مطالعه بیت کوین). اقتصاد اسلامی, 1397; 18(72): 213-243. از سال 2009 شکل نوینی از پول در عرصه اقتصاد دنیا تحت عنوان «پول رمزنگاری­شده» به وجود آمد. این وسیله مبادله از دسترس سیستم بانکی و بانک مرکزی خارج است و تنها از طریق فضای مجازی منتقل می‌شود. با فراگیرشدن این نوع پول در رفتارها و روابط اقتصادی، یک تحول جدی در ماهیت و کارکرد اقتصادی پول ایجاد می‌شود. تغییر در ماهیت و کارکرد اقتصادی ممکن است کارکرد فقهی متفاوتی نسبت به پول بانکی به دنبال داشته باشد؛ بنابراین لازم است دستگاه فقه ماهیت و کارکرد‌های اقتصادی این پدیده را با دقت شناسایی نماید و احکام مجاز و غیر مجاز به‌کارگیری آن را در روابط اقتصادی روشن کند. در پژوهش حاضر ابتدا موضوع­شناسی پول­های رمزنگاری­شده صورت پذیرفته، سپس ابعاد فقهی موضوع با دو رویکرد فقه فردی و حکومتی و همچنین در دو سطح معامله و معدن­کاوی تبیین گشته است. در آخر نیز با استفاده از روش تحقیق اجتهاد چندمرحله­ای و نظر خبرگان مالی اسلامی و مراجع عظام تقلید شروط جواز استفاده از پول­های رمزنگاری‌شده احصا گردیده است. بر این اساس یکی از انواع این پول­ها (بیت‌کوین) با شروط تطبیق داده و وجود شبهه «لا ضرر»، استفاده از آن را با اشکال فقهی روبه‌رو نموده است. Money is one of the phenomena that are used in the economic life of people for a long time. Despite the simple appearance, this phenomenon is constantly evolving. Since 2009, a new form of money has been created in the world under the title "Cryptocurrency". This exchange facility is out of reach of the banking system and the central bank and is only transmitted through cyberspace. As this kind of money becomes widespread in the economic relations of the world, there is a serious transformation in the nature and functioning of the money. Changes in the nature and function of the economy may have different jurisprudential functions than fiat money. Therefore, it is necessary to accurately identify the jurisprudence system, the nature and economic functions of this phenomenon, and clarify the types of permissible and unlawful rulings in economic relations. In this regard, in this research, at first the cryptocurrency is introduced and then the jurisprudential aspects of the subject were explained by two approaches of individual and governmental jurisprudence, as well as in two levels of transaction and mining. Finally, using the method of multi-stage ijtihad research and the views of the Islamic finance experts and the authorities, imitating the license terms, the use Cryptocurrency has been counted. Accordingly, one of these types of money, called Bitcoin, is adapted to those circumstances and finally the existence of the doubtful of "La Darar and La Darar" has encountered it with illegal forms. سلطانی، محمد و حمید اسدی؛ «ماهیت حقوقی پرداخت در پول الکترونیک»؛پژوهشنامه حقوق اسلامی؛ س16، ش41، 1394. سلیمانی پور، محمد و همکاران؛ «بررسی فقهی پول مجازی»، دوفصلنامه تحقیقات مالی اسلامی؛ ش12، 1396. سیدحسینی، میرمیثم و میثم دعایی ؛ «بیت‌کوین، نخستین پول مجازی»، ماهنامه بورس؛ ش114 و 115، 1393. میرزاخانی، رضا؛ بیت­کوین و ماهیت مالی- فقهی پول مجازی (گزارش)؛ تهران: مرکز پژوهش، توسعه و مطالعات اسلامی سازمان بورس و اوراق بهادار، 1396. Andersen, T. G., Bollerslev, T., Diebold, F. X., & Labys, P; “Modeling and forecasting realized volatility”, Econometrica; No.71(2) , 2003. Appel, M. S.; Canada, Can You Take A Security Interest In Bitcoin? ; Retrieved from http://www.mondaq.com, 2014. Bank of Mexico; Warnings on the use of virtual assets as substitutes for means of payment in legal tender; Retrieved from: http://www.banxico.org.mx/informacion-para-la-prensa/comunicados/miscelaneos/boletines/%7B5D9E200E-2316-A4B8-92A9-3A5F74938B87%7D.pdf. Böhme, R., Christin, N., Edelman, B., & Moore, T.; “Bitcoin: Economics, technology, and governance”, The Journal of Economic Perspectives; 2015. Cian, H., & Li, Z. H. E; “The Role Decentralised Non-Regulated Virtual Currencies Play in Facilitating Unlawful Financial Transactions”, Master of Science Thesis in KTH university; NO.80, 2016. Retrived from: http://www.diva-portal.org; 2016. Chuen, D. L. K.; “Handbook of digital currency: Bitcoin, innovation, financial instruments, and big data”, Academic Press, 2015. Cuthbertson, A.; “Cryptocurrency Round-Up: Bolivian Bitcoin Ban, IOS Apps & Dogecoin at McDonald's”, Retrieved from ibtimes.co.uk. ; 2014. Dibrova, A.; “Virtual Currency: New Step in Monetary Development”, Procedia-Social and Behavioral Sciences; 229, 2016. European Central Bank; “Virtual currency schemes–a further analysis’’; retrieved from: https://www.ecb.europa.eu/pub/pdf/other/virtualcurrencyschemesen. Europian Banking Authority (EBA); EBA Opinion on virtual currencies. Retrieved from https://www.eba.europa.eu/.../EBA-Op-2014-08+Opinion+on+Virtual+Currencies.pdf; 2014. Financial Crimes Enforcement Network; Bank Secrecy Act Regulations; 76, 2011. Financial Action Task Force; “Virtual currencies: key definitions and potential AML/CFT risks”, Financial Action Task Force (FATF) Report; June 2014. García, C. A; “Trading with bitcoin is illegal: Superfinanciera’’, El Tiempo; Retrieved from http://www.eltiempo.com, 2014. Halaburda, Hanna; “Beyond Bitcoin”, Palgrave Macmillan; 2016. Hartge-Hazelman, B.; “Glenn Stevens says Bitcoins show promise, but so did tulips”, The Australian Financial Review; 2013. He, D., Habermeier, K. F., Leckow, R. B., Haksar, V., Almeida, Y., Kashima, M & Yepes, C. V.; “Virtual Currencies and Beyond: Initial Considerations’’, International Monetary Fund; No. 16/3, 2016. Helbling, Philipp; “Virtual Currency Schemes an Assessment of Bitcoin in Respect to the Properties of Money and the Real Economy’’, master seminar in university of Basel; Retrieved from: http://watchthemgo.org/wp-content/uploads/2016/02/Virtual_ Currency_Schemes_Bitcoin.pdf, 2014. Jingzhi Guo and Angelina Chow; “Virtual Money Systems: a Phenomenal Analysis’’, in: Proc. IEEE Joint Conf. on E-Commerce Technology (IEEE CEC'08) and Enterprise Computing, E-Commerce and E-Services (EEE'08), IEEE Computer Society (Washington D.C., USA, July 21-24); 2008. Kelly, B.; The Bitcoin Big Bang: How alternative currencies are about to change the world; John Wiley & Sons, 2014. Knutsen, E.; “Bitcoin, an experimental digital currency, has gained a toehold in the Middle East”, The Daily Star; p. 5; 2014. Krause, M.; “Bitcoin: Implications for the Developing World’’, CMC Senior Theses; Paper 1261. Retrived from: http://scholarship.claremont.edu/cmc_theses/1261, 2016. Lo, S., & Wang, C.; “Bitcoin as money?’’, Federal Reserve Bank of Boston; 2015. MacCarthy, Mark. ; “What Payment Inter- mediaries Are Doing about Online Liability and Why It Matters’’, Berkeley Technology Law Journal; 25(2), 2010. McAleer, M., & Medeiros, M. C.; “Realized volatility, A review’’, Econometric Reviews; 27(1-3), 2008. Mishkin, F. S.; The economics of money, banking, and financial markets; Pearson education, 2007. Nakamoto, S.; “Bitcoin: A peer-to-peer electronic cash system’’, available at: http://www.cryptovest.co.uk/resources/Bitcoin%20 paper%20Original.pdf, 2008. Pärlstrand, E., & Rydén, O.; Explaining the market price of Bitcoin and other Cryptocurrencies with Statistical Analysis; Department of Mathematics. University of Kungliga Tekniska Högskolan. Retrived from: http://www.diva- portal.org/smash/record.jsf?pid=diva2%3A814478&dswid=-4217, 2015. Reserve Bank of New Zealand; Notes and Coins Frequently Asked Questions; Retrieved from rbnz.govt.nz, 2013. Rubenfeld, S.; “Canada Enacts Bitcoin Regulations”, Risk and Compliance Journal; 2014. Stanley-Smith, J.; Finland recognises Bitcoin services as VAT exempt; Retrieved from International Tax Review: http://www.internationaltaxreview.com/, 2014. Surda, P.; Economics of Bitcoin: is Bitcoin an alternative to fiat currencies and gold? ; dev. economicsofbitcoin.com/mastersthesis/mastersthesis-surda-2012-11-19b.pdf, 2012. Szczepański, M.; “Bitcoin: Market, economics and regulation”, European Parliamentary Research Service; 2014. The Law Library of Congress, Global Legal Research Center; Regulation of Bitcoin in Selected Jurisdictions; Retrieved from http://www.loc.gov/law/help/bitcoin-survey/regulation-of-bitcoin.pdf; 2014. Yermack, D.; “Is Bitcoin a real currency? An economic appraisal”, National Bureau of Economic Research; No. w19747, 2013. Zivot, E., & Wang, J.; “Rolling analysis of time series. In Modeling Financial Time Series with S-Plus®”, Springer New York; 2003.